When help was sought it was granted. In the case of Lindsey Graham it was slanted. IF ONE CAN’T GO TO HIS OWN SENATOR FOR HELP IN A CASE THAT HAS LONG SINCE BEEN CLOSED WHY BOTHER TO REELECT THIS SENATOR? FOR THOSE NEW TO THIS MISCARRIAGE OF JUSTICE ALL YOU NEED IS BELOW. MANY HAVE BEEN ASKED TO USE THE BOILER PLATE BELOW, YOU AGREE, BUT LIFE JUST GET’S IN THE WAY. PLEASE COPY AND PASTE TODAY, SEND THIS LINK AND SITE TO YOUR FRIENDS BY EMAIL YOUR ACTIONS WILL HELP SET A YOUNG SOLDIER FREE. THANKS J.C. Here is my in depth research and first article. Boiler plate and video below. How can the military order soldiers to go on an illegal mission and no officers held accountable? The military was once a proud profession. We have the best and brightest now with an all voluntary service. Why would anybody want to join when our government feels the need to play PC games and sacrifice our young men? I’m asking you to please reconsider this issue in light of a young man following orders and has paid dearly for it. Had Corey Clagett been a cold blooded murderer he would have killed the Iraqi’s without giving it a second thought. He didn’t do that. He took them prisoner, and asked his superiors what to do, they said kill them, admittedly an illegal order. What really was he to do? Enough is enough, please find it in your hearts to show compassion. 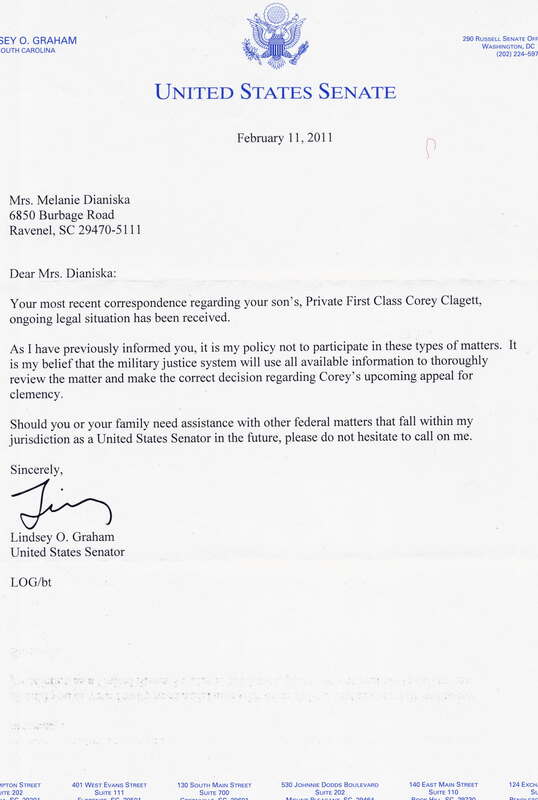 I am writing to indicate my support for Corey Clagett in his upcoming clemency hearing on June 3, 2011. After reading about Corey’s case and learning the circumstances of his incarceration, I feel a miscarriage of justice has occurred. I hope you find the arguments of Corey’s attorney, Tim Parlatore, as persuasive as I do. First, I believe the American justice system should not punish soldiers, fighting to protect that very system, in the same way it punishes those who commit heinous crimes here within our own borders. A killing in the midst of war, particularly when following direct orders, is not the same as a premeditated murder in the United States, and the punishment should reflect this key difference. Second, instead of being incarcerated, Corey vitally needs psychological treatment from the VA. Corey may have committed a wrong, but the four years in solitary confinement he has already served have been more than enough, and he now deserves rehabilitating treatment. Third, as I understand it, Corey’s sentence is much longer than those who committed the crime with him, and in particular the man who ordered Corey to kill the Iraqis instead of taking them prisoner. This information came as a complete shock to me. It appears to have been brought about by a last-minute and inadequate change in legal representation. This hardly seems to be justice. Finally, I believe that Corey should receive a lower sentence, at the very least in line with those of his peers, given his efforts from the very beginning to cooperate with the Government. Corey’s cooperation demonstrates he took responsibility for his actions. Thank you for taking the time to read about a cause about which I care deeply. 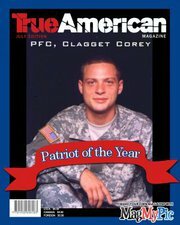 As an American who appreciates the sacrifices made on my behalf by our troops in hostile lands, I implore you to grant Corey’s clemency petition and release him. This entry was posted in When a hero has another hero's back thank you Congressman Allen West and tagged A conservative blogspot.com, Dump The Rino.com, Leavenworth Freedom Ride, Lt.Col Allen West. Bookmark the permalink. This is an unjust confinement and Corey should be set free. The guilty are the ones that ordered him to commit murder. Our Army should be better than that. In deed Lois thanks so much for taking the time to read the article. Corey is up for clemency again on JUNE 3rd. 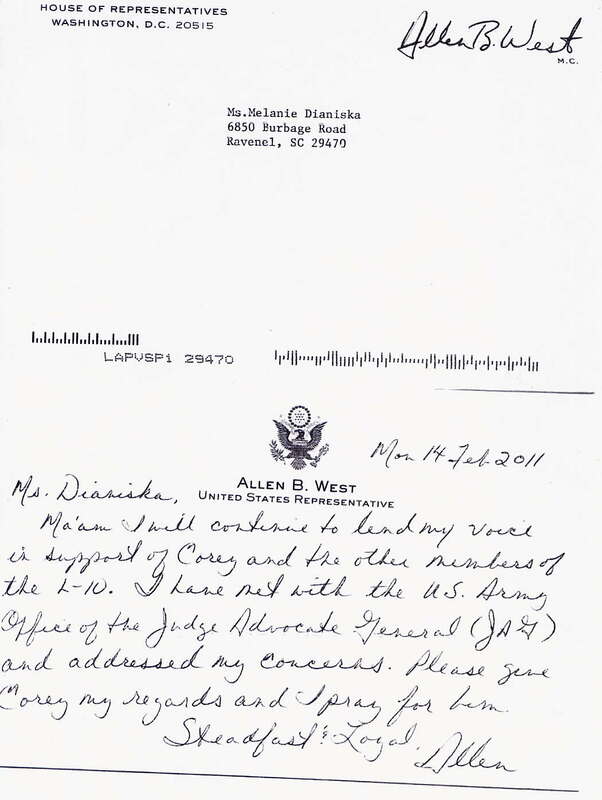 This time all the letters are going from his attorney to the Secretary of the Army. I would appreciate it if you would consider sending the link to your friends by Email, as them to check it out, use the boiler plate, fax to the attorney as soon as possible Ask them to click here https://lindseygrahamnomore.wordpress.com/2011/04/20/when-a-hero-has-another-heros-back-thank-you-congressman-allen-west Thanks J.C.
Is there any doubt as to which of these two men is a true and loyal patriot? Allen West stands up for our uniformed sons, daughters, husbands, wives, loved ones! Graham is nothing more than a wishy-washy RINO. difference between a Man and a Whimp!! Go West, America!!! Indeed, Grahams reason ” I don’t chose to get involved is deplorable. He thinks he represents South Carolina, well he has never done much of a job, he has let Corey down big time. Thanks always for your comments. i love him! at first i was a little worried about him being a hawk, but he is actually against the military being in afgan right now. i think i like him more everyday! Yo, Israel & all…listen Up!! !…Graham is NOT worthy to continue in the U.S. Senate…DISGRACEFUL!!! “…it is my policy not to participate in these matters.”…..WTF? It’s MY policy not to participate in letting a fellow American citizen lay wounded in the field or left hung out to dry! Lindsay: I am done with thee! I have many thousands of friends/readers/fans/homeboyz/ladies/etc. who live and vote in S. Carolina…they are independent thinkers, but they WILL accept my presentation of evidence! Oh, yes we can! Dr. Gary K (Boston/etc) Graham is a bum. You absolutely nailed that one Doc that was the key phrase. Help me by sending this to all your friends here and in Israel through Email. P.S. we need to get to the article on the Jewish voter’s continued desire to support and administration that has turned its back on Israel and will likely lead them and the word into the unthinkable with Iran. Danke! J.C. I love Allen West and his willingness to stand for those who stand for us on the battle field. I have never been so ashamed of a “Representative” as I am of Graham after reading that letter.. He is a disgrace.. Thank you Cindy, you know how hard all of us have been working on this. If you feel the spirit please send to as many folks as possible the link by Email, and ask them to do the same. Graham has to go and I like to think that Corey is keeping Obama’s cell warm, J.C. The citizens of South Carolina must determine when Goober’s current term ends, when the primary election is and the filing deadline for petitions in the primary. The next step is to find a credible, articulate, qualified Conservative candidate to oppose Goober in the primary and fill his war chest with money. Opposition research should begin immediately. Video, audio and documentary evidence of every stupid, treacherous and damaging statement, quote and vote made by Goober should be accumulated, verified and organized into campaign spots ready to air. A web site should be created to showcase those commercials, and an email campaign started to propagate awareness and raise funds. Goober is just one RINO. The others must be primaried too. Thanks my friend with a little help from my friends this will be all inclusive. Right now I’ve really got my eye on Goober because he won’t back Corey. He does not belong in the U.S. Senate. Thanks for your sage comments as usual. J.C. Thank God Allen West is coming in to help Corey! I’m saddened that Senator Graham would not take the time and effort to search further & help these young military people who were tossed into another world from where they grew up. What a shame! I will make certain this gets passed around plenty. Why call yourself a ‘servant of the people’ and then refuse your service when asked. One more bad apple to add to the bunch. I think we have more than enough already. God will help Corey & the others in this awful situation. We all can pray, as well as write letters. Thanks again Jim, for caring about those who so willingly served us because our government asked them, but now have turned their backs on them as if their lives have no importance. You got that right Graham is nothing but a rail rider. Hell he just found out that there may not be any science to global warming. A big WTF over? He has become a useless idiot. J.C. Hear ye Hear ye….Supreme example of difference between a leader and a politician. Thanks Otto, indeed it does, thanks for stopping by and leaving your thoughts they are on the beam, with the exception that this politician is going down in 2014! J.C.
Lindsey Graham is someone I have blasted in my political group. Have no respect for him! Thanks for posting this, Jim. Well written, and yes, I agree that in the context of war–whatever else happened here–is hardly on the same level as premeditated murder–a term I find ludicrous for its malicious implications when soldiers are asked to make possibly the ultimate sacrifice in a distant land in unfamiliar surroundings, in a setting where their very lives depend often on snap judgments about just who is doing what–or about to–and where protocol and decorum often fail even the world’s best military training. Sometimes there are no moves one can make for every contingency or circumstance, and you have only your native instincts, judgments, and reflexes to fall back on to guide you. While not an expert on the law, military justice, and to what degree—if indeed any—sitting U.S. Senators can or should intervene, this appears to be a personal policy of Senator Graham’s, even though elsewhere he does imply it falls outside his jurisdiction. So he says. So be it. He’s made his take on this matter clear. I would say, however, that he could at least make some other kind of statement, or suggestion beyond just the legalese, about the situation in general moral support of the soldier and his family at this difficult time, where a man who served our nation is facing incarceration and dishonor without, in my opinion, the full complement of facts being laid out. The office of a U.S. Senator is a very powerful one, never to be taken lightly. Theirs, along with our House of Representatives, constitute the true vox populi, or “voice of the people”. Their words and deeds on matters (both legal and non-legal moral issues) that are pondered on our behalf have far-reaching consequences to the entire nation on a whole range of issues that often seem dry and inconsequential, but in full effect are not. I suggest the Senator needs to hear from his constituents. Right about now would be great. Justice delayed is justice denied–even if stalled for what some deem are the correct reasons. We do not want Grahamnesty in our state either ! I am pretty sure this misguided nitwit will run again in 2014, as he is a ”career politician” .Some comments were made about his ”dis service ” to our state by me on our AIP call last night . Reading his response was nothing short of cowardice on that letter and whoever said they ”like” him now because he wants the troops out , is sadly misinformed on how he shifts like the wind on very important issues. Thanks Pam, Please feel free to post this article on your website. You are on target. I’m going there next. I would love to see a link or links from AIP on him. This is a brand new site and my goal from way out here in CA is to rid congress of all trolls like Ms. Lindsey. Sadly, Jim DeMint who seems like a good guy is worse on this matter. He is either dumber than a post or doesn’t understand the law or has an agenda. He has never responded in writing to Corey’s Mom. Nothing, nada, zip! After multiple conversations with his office, as a reporter I wouldn’t give up. Finally a woman, there said, it’s a matter of “separation of powers.” This is absolute bunk. Corey’s attorney is a graduate of Annapolis, and knows the law and the Constitution quite well. There is nothing prohibiting DeMint for getting involved, writing a letter of support, this is not a pending case or on going trial. The matter has been settled 5 years ago. DeMint needs to get a clue about about the law. I don’t think a person that doesn’t understand it should represent “We the people” Thanks for your comments, I’m J.C.
Allen West continues to impress me…and his letter is even hand-written; something you don’t see too much these days. He is a true patriot who stands up for true justice. God Bless Mr. Allen West and Pfc Corey Clagget. I have No comment for the “other”. Why Won’t Lindsey Graham Help Pfc. Corey Clagett who Rots in solitary confinement in Leavenworth?